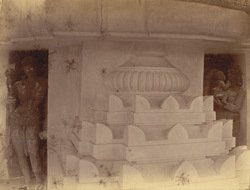 Photograph of two female statues on the north façade of the shrine of the Jagannatha Temple at Puri, from the Archaeological Survey of India Collections, taken by Poorno Chander Mukherji in the 1890s. Puri in Orissa, is one of the four traditional pilgrimage centres for Hindus, and the centre of the cult of Jagannatha, a form of Krishna. The main shrine, with a towered sanctuary and mandapa with a pyramidal roof, is attributed to Anantavarman Chodaganga of the Eastern Ganga dynasty (r.1077-1147). Other mandapas were added in the 13th and 15th Centuries. The rectangular complex has many other minor shrines and is within a high double-walled enclosure with four gates at the cardinal points. The tower rising over the sanctuary is richly decorated with plaster figures from Vaishnava and Ramayana myths. The miniature towers and the walls of the sanctuary and of the mandapa have sculptures set in niches. Large figures of fully modelled maidens are situated in the recesses in betwen the niches.